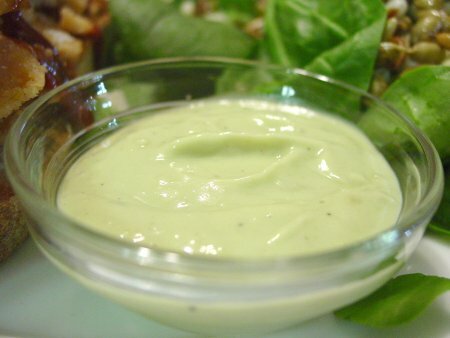 A couple of weeks ago I posted that I had made a yogurt-avocado dressing for my salad and how delicious and simple it was. A friend of mine asked me to share the recipe so here it is. I didn’t take any pictures, but it’s so quick and easy, you don’t even need the pictures. This recipe is originally from a Mark Bittman cookbook; it’d be great as a dip for veggies, as a “sauce” or condiment for burgers or grilled chicken sandwiches, or as a dressing for salad. This recipe makes about a cup, cup and a half, of dressing but it doesn’t keep, so use it within a day. In a food processor, combine the yogurt, garlic clove, lemon juice, avocado, salt and freshly ground pepper and pulse to a creamy consistency. You can also do this by hand by mashing the avocado, then adding the rest of the ingredients and stirring. Since I didn’t include any pictures this time, here’s a quick video I found on how to cut and pit an avocado. I just made this right now, Feb 19 at 3:30. JUST DELICIOUS! Thank you!